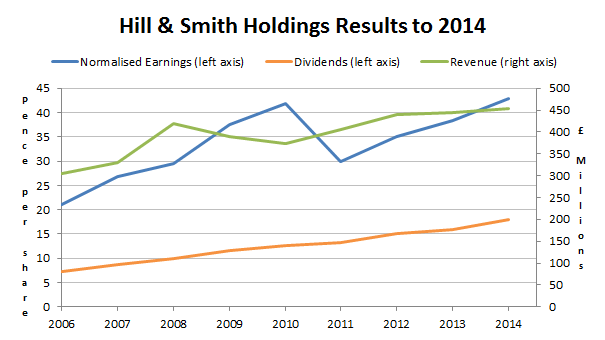 Hill & Smith Holdings is a highly successful small-cap company which I added to the UKVI model portfolio back in 2013. 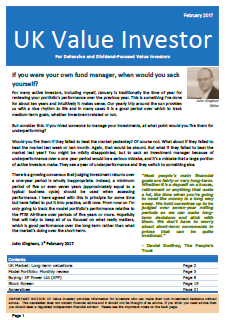 When I added Hill & Smith to the model portfolio it combined two themes which are typical of defensive value investments: 1) It had a long-term track record of consistent growth and 2) it was cautious about short-term future results, but not its long-term future results. Fortunately for shareholders, management’s caution about the company’s short-term future only lasted through 2013. 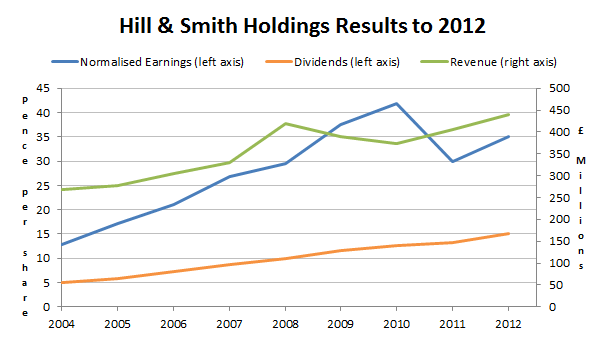 By 2014 Hill & Smith returned to double digit growth and the share price quickly followed, as the chart below shows. Hill & Smith is unusual in that it is a true “holding” company. The plc is made up of around 30 subsidiaries which are managed as individual companies, but which also have access to information, services or products from other companies within the group. To a large extent the role of the directors is to acquire fundamentally sound companies which are trading at attractive prices, often because of operational issues which Hill & Smith can then hopefully sort out. This sounds a lot like value investing, and it has produced results that any value investor would be proud of. The company’s financial track record is exceptional. No, it isn’t the next Google or Microsoft, but it has grown far faster than the average company and with much greater consistency. You would be hard pressed to even spot the global financial crisis in the chart above, although of course that does have something to do with the relatively defensive markets which it operates in, i.e. infrastructure for utilities and roads. The table below shows Hill & Smith’s results compared to the FTSE 100 at the time of purchase. Hill & Smith had an above market-average growth rate and growth quality, while post-tax profitability was only slightly below average (although the FTSE 100’s profitability of 10% is only an estimate, and is deliberately likely to be on the high side). On the valuation side, the company’s PE ratio and dividend yield were better than average, while its longer-term PE10 and PD10 ratios (price to 10-year average earnings and dividends) were slightly worse than the market average, although that is to be expected from a company with an above average growth rate. However, relatively to other companies with consistent histories of double digit growth rates, Hill & Smith’s valuation ratios and dividend yield were unusually attractive. The opportunity to buy a company with a long history of double digit growth combined with a market-beating dividend yield seemed compelling, and so after working through the usual company analysis process (using these investment spreadsheets and worksheets) I added it to the model portfolio in June 2013 at 431 pence per share. Sometimes investing is easy, or at least it can seem that way. Much like earlier investments in Cranswick or JD Sports, Hill & Smith produced positive results almost from the beginning. I said “almost from the beginning” because there was an initial period of disappointing results, although the company had already warned investors about this and those warnings were very likely the cause of the attractive share price. In the company’s 2013 interim results, published shortly after the shares were added to the model portfolio, underlying earnings per share fell by 10%. The results included the dreaded phrase “our full year performance is likely to be marginally below our previous expectations”, where in reality “marginally below” can often end up meaning “dramatically worse”. However, those bearish words were tempered with a statement which should usually be taken with a pinch of salt: “The board remains confident that, in the medium to long term, our international diversity and market strength will continue to provide the resilience of performance seen in previous years”. 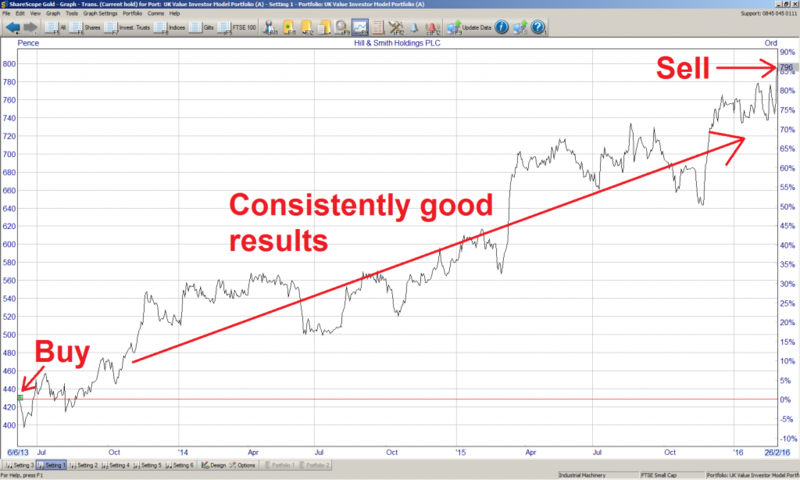 Despite this negative short-term outlook the dividend was increased by 3%. By the time the 2013 annual results were published in early 2014, the negative picture was fading and it was beginning to look like Hill & Smith would resume its historic growth pattern. Record results were produced in the second half of 2013, the full-year dividend went up by 6.7% and the share price went up by almost 30%. This positive pattern was repeated in 2014 when, among other positive news, the UK government announced the Road Investment Strategy, its largest ever investment plan in the UK road network, covering the period from 2015 to 2021. Given that Hill & Smith designs and manufactures many of the crash barriers and signs that adorn our motorways, this was always going to be very good for the company. At the 2014 results, double digit growth was back on the cards, with earnings increasing by 11% and dividends by 13%. For 2015 the picture isn’t fully clear as the results won’t be published until March 2016. However, at the interim results the dividend went up by 11%, with expectations that a similar growth rate will be recorded for the full year. The chart below shows the company’s continued impressive progress, and how the caution and concern of 2013 were, with hindsight, largely unwarranted. As usual, once good news begins to flow consistently over a period of time, the market reacts. In this case the market’s reaction was to re-rate Hill & Smith’s shares from a dividend yield of 3.5%, which was slightly above the market average, to a yield today of 2.3%, which is a long way below the FTSE 100’s yield of 4.2%. Of course, Hill & Smith has a very good chance of growing its dividend far faster than the market average, and so today’s yield of 2.3% is perhaps entirely reasonable. 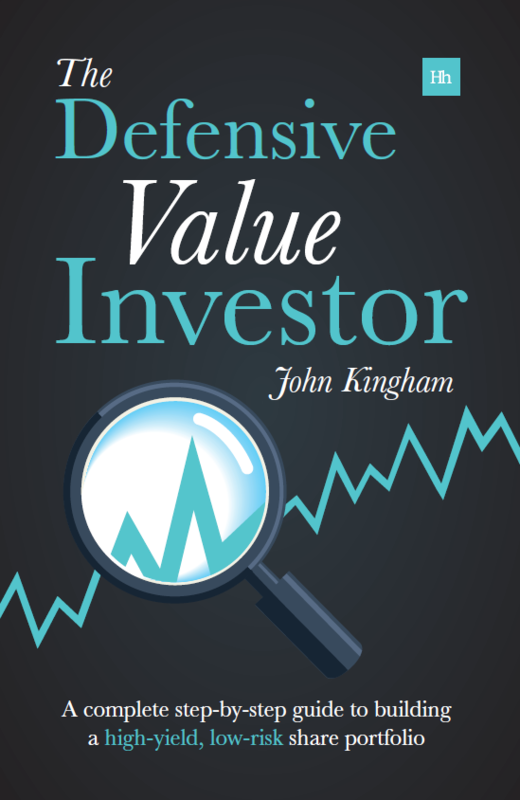 But a stock which is trading at a reasonable price is unlikely to make a good value investment. The market expects Hill & Smith’s future results to be excellent, and so those results are already effectively baked into the valuation pie. This has become especially noticeable recently as the FTSE 100 and other global indices have entered bear market territory. As markets and individual stocks have been falling left, right and centre, Hill & Smith’s share price has continued to grow. It is up more than 5% in 2016 and up almost more than 30% from the start of 2015. This is good for Hill & Smith’s shareholders, but at some point the rising price and falling dividend yield mean that most of the gains lie in the past, while ahead lies the risk that the shares will be re-rated downwards again if the company hits even the slightest bump in the road. As a result I took the opportunity this week to lock in those existing capital gains and bring the investment in Hill & Smith to an end. Next month I will reinvest the proceeds into a new holding, and of course I hope that investment can perform even remotely as well as this one. Note: You can read the full pre-purchase review of Hill & Smith in the June 2013 issue of UK Value Investor (PDF).